Company time shows time tracked for all team members. Use this to see who is tracking less than their capacity at a glance. Company time gives you an insight into time entries for all your employees. Switch between weeks using arrows or pick a date from a calendar. Click on a specific column and you'll get a detailed report from multiple people for that day. Click on a row and you'll get a detailed report for that person throughout the whole week. Click on a cell in the table and you'll get a detailed report for that person for that day. Company time shows you time entries for all your employees by default. 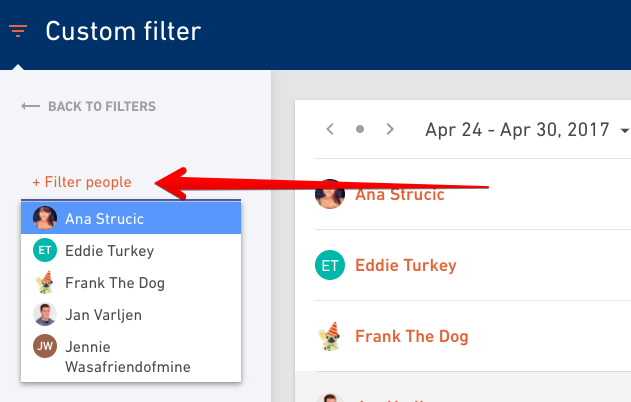 If you want to customize it, go to filters on the left and create a custom filter. 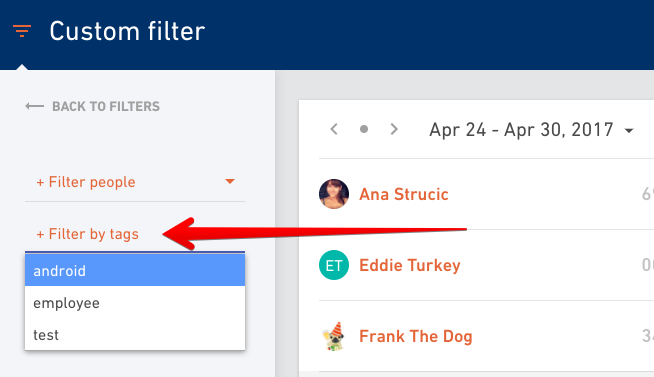 If you want to see time entries for example only for your team, click on the New filter, select people you want to add to the list and save your custom filter. You can also create a filter by using tags. If all members of Android team have an Android tag, you can just add that tag instead of adding team members one by one.